Thrill the World: FREE Dance Workshops! 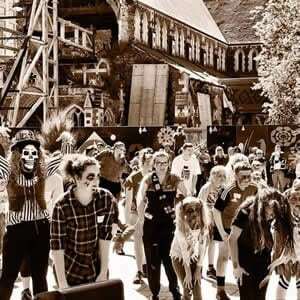 Did you see the news last October when a zombie horde took over Cathedral Square and busted out Michael Jackson’s Thriller? We’re doing it all again and this year as part of the inaugural FoUND: Festival of the (Un)Dead which runs for the entire weekend Fri 26-Sun 28 October. This is your chance to be a part of Christchurch’s newest (and quirkiest) festival. Gather your zombie horde and theme your costumes to be in to win awesome prizes on the day – Sunday 28 October at 11am sharp! Meanwhile, you need to master the moves. The good news is, it has been broken down into the simplest system, and to make it even easier, more fun (and great fitness! ), we’re running FREE dance workshops at ITR during the month of October for all ages. Thurs 4 Oct 10am – 1PM ITR Gloucester Room – School Holiday Fun. Minifies will be demonstrating their zombie make up techniques and there will even be cool makeup kits available for purchase on the day. What’s the purpose, and why ‘Thriller’? to bring dance to people all over the world. to remind everyone that before you believed you couldn’t dance, you did! Thriller is iconic and recognisable with fantastic choreography and it’s easy to learn! A Charitable Focus In addition to sharing the joy of dance, the celebration of community and the passion for living, Thrill The World was developed so that each individual event around the world could be used to raise money for a local charity. Koha is collected on the day from participating groups or individuals. Here in Christchurch, we’ve chosen to support a programme called ‘Dancing like the Stars’ which is presented annually at the Isaac Theatre Royal. Dancing like the Stars is a free nine-week programme that aims to promote and provide an active lifestyle through dance – a non-competitive form of physical activity – to children who would not normally be able to participate in dance for recreation. The programme has several other benefits, which include building basic social skills and interactions, team building and teaching children about other cultures.